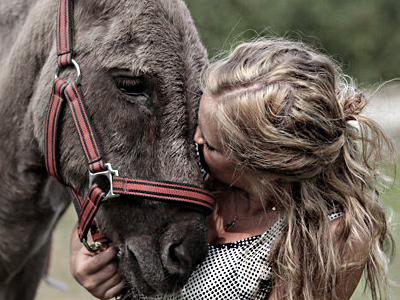 A Donkey named Anapka, who received worldwide attention in July 2010 after a parasail ride over an Azov Sea beach, has died of old age at plush stables in Moscow. The donkey’s 30-minute flight was a PR stunt by the owners of a company offering adventure rides, and provoked an international public outcry over the treatment of the animal. Following the uproar, the famous donkey was transferred to a five-star home – the Kremlin Riding School – as a gesture of generosity by the British tabloid The Sun. There, Anapka had the best medical treatment, a healthy diet and all the comfort an equine could wish for. Last autumn she was transferred to yet another stable near Moscow, where she could enjoy the company of other donkeys, reports Komsomolskaya Pravda newspaper. However the age-related conditions of the donkey, who was 17 at the time of her endeavor, took their toll. In mid-January, Anapka’s heart failed after several weeks of illness.